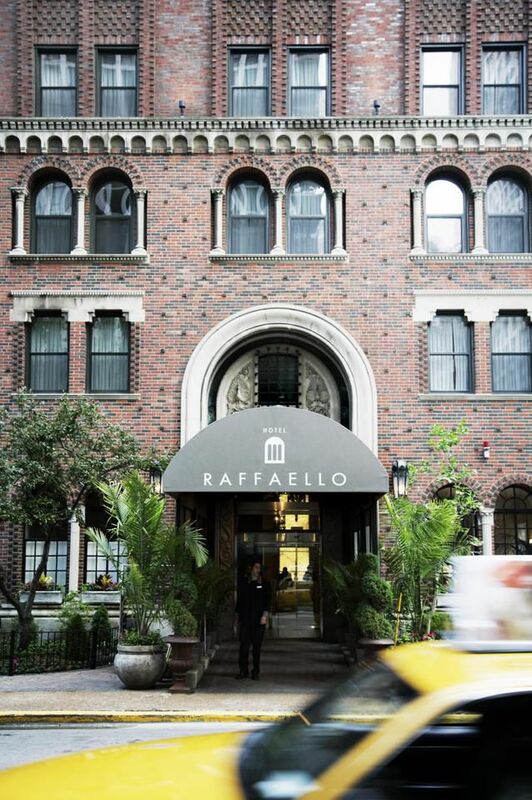 The Raffaello Hotel (formerly The Raphael) underwent a $20 million renovation in 2006. It now boasts "a comfortable combination of being high luxury and environmentally friendly." The Raffaello Hotel was previously known as "The Raphael," but in 2006 the property underwent not only a name change, but its South Beach owners made a $20 million investment in interior furnishings. It also completely updated the decor while maintaining the historic architecture of the building and lobby. The hotel is in a great location, walking distance to the lakefront, Michigan Avenue shopping, Rush Street bars and restaurants, and the John Hancock Center. Those millions of dollars went to good use when the Raffaello upgraded the rooms. They now feature luxury items such as 500-thread-count sheets, flat-screen televisions, "rain showerheads" and Aveda products in the bathrooms. Other nice touches are in-room microwaves, radios with MP3 connectors, and wireless and wired internet connections. Suites are available with the same appointments and the addition of a separate living space with queen-size pull out couch. The Raffaello has a full business center with video conferencing, computer workstations, and copiers/printers that are available all day and night. After business there's pleasure, and Drumbar looks and feels like the type of place that would have gotten plenty of Don Draper action back in the 1960s. It’s located on the 18th floor of the hotel and features a bustling rooftop patio during warm months. While the classic cocktail list is the obvious choice for drinking around these parts, the progressive menu should pique the interest of those more adventurous. That list is seasonal and experimental with rare ingredients and hard-to-find spirits. Drumbar also boasts an extensive collection of rare finds when it comes to scotch. For dining on premises there is Pelago Ristorante, an Italian-focused eatery from Michelin star chef Mauro Mafrici. It's open for lunch and dinner, and the chef his team specialize in house-made pastas, risotto and seafood entrees. Pelago is also responsible for room service at the property. And for those craving sweet bites, Glazed & Infused should satisfy any sweet tooth. It opens daily at 7 a.m. with fresh, handcrafted doughnuts. It also serves Bow Truss Coffee, a local Chicago Coffee Roaster. Historic Water Tower. Even though it stands in the shadows of the tall buildings surrounding it, when the historic Water Tower was first built in 1869, its 154 foot height was probably pretty impressive. Even though it stands in the shadows of the tall buildings surrounding it, when the historic Water Tower was first built in 1869, its 154 foot height was probably pretty impressive. Navy Pier. Originally a shipping and recreational facility, Navy Pier has a rich history and has evolved into one of the most popular spots for people visiting Chicago. Navy Pier is separated into a number of areas, including Gateway Park, Family Pavilion, South Arcade, Navy Pier Park and Festival Hall. Noble Horse Carriages Chicago. Spend any amount of time wandering around the North Michigan Avenue shopping district and you're bound to seem them: vintage carriages being pulled by noble steeds ambling along next to the bustling traffic. These are the Noble Horse Carriages, part of what makes this area of the city unique. While many utilize the carriages for special occasions such as weddings or proms, it's also a nice break to be able to relax and enjoy the sights and give those feet a rest. Tribune Tower. Home of the Chicago Tribune, the iconic neo-Gothic skyscraper sits at the south end of the Magnificent Mile and serves as a gateway to the Michigan Avenue shopping mecca along with the Wrigley Building. The final design of the building was the result of the Tribune holding a design competition which garnered 260 entries. Water Tower Place. The multi-level indoor shopping mall features more than 100 stores. It's anchored by a seven-story Macy's, shopping options like Forever 21, American Girl Place, and Abercrombie & Fitch surround an open eight level atrium.